Listing courtesy of Blue Bunny Hawaii Realty LLC. Listing courtesy of TH Realty, Inc..
Waikiki is the Hawaii's most saught after destination for good reason. With crystal blue waters, stretches of sandy beach, and a multi-cultural ambiance, Waikiki is simply hard to resist. People all over the world come to Waikiki to enjoy the beaches, tropcial weather, sightseeing, and fine dining the area has to offer. This desirability also makes Waikiki one of the premier locations in all of Hawaii for real estate investors. New buildings such as Trump International Hotel & Tower Waikiki Beachwalk, The Watermark, andAllure Waikiki have sprung up to meet the rising demand for both real estate investors, and locals alike to own a part of the Waikiki dream. 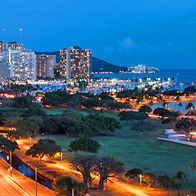 Waikiki is also a popular location for those looking for a second home to invest. The warm-weather year round make Waikiki perfect for "Mainlanders" who want to spend the winter months away from the snow and cold. Waikiki offers a range of real estate options, from luxury condominiums, to smaller studio suites, there is something for anyone who wants to enjoy this Hawaii Landmark. To find out more about Waikiki Real Estate, contact our Waikiki Specialist.